I know it is barely summer (well, is it even technically summer yet?) but when I saw these I couldn't help but think of Fall. I am in love with sneak peaks at Madewell's Fall 2012 look-book! I can see myself in all of these looks! I definitely plan on adding some of these pieces to my wardrobe! You??? BUT wait!!! Back to summer - because that is a season where no day can not be enjoyed!!! great looks love all the colors !! I know it's summer but I want EVERYTHING!!!!!!! I love that outfit with the animal sweater. I'm ok with looking forward to fall...hopefully by then I can fit back into normal clothes. Can't wait to scoop up that skirt! drooling, dying, want it ALL! Damn that madewell! Always hitting up my piggy bank! I know as soon as summer hits sweltering I'll be craving for all of the above and a crisp, cool night! 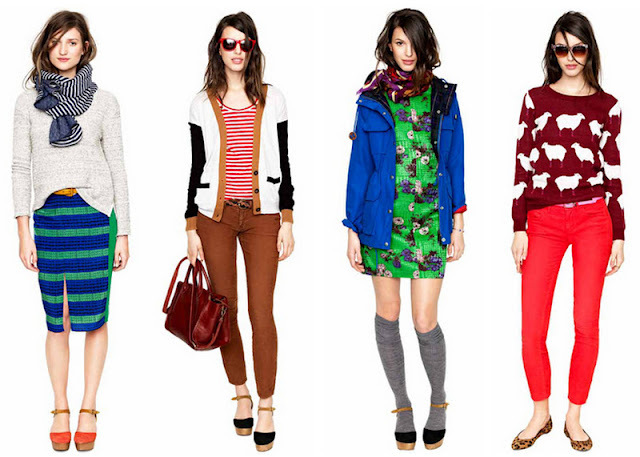 I'm always all over Madewell's collections -- the cardigan in the second outfit is fab! Love love love that sheep sweater! Despite the fact that it is near 100 outside today, I still have my eye out for a chic tweed jacket... gotta be ready for fall!